When your smile is crooked and misaligned, it can be difficult to feel good about yourself. Fortunately, advancements in orthodontics has come a long way, making it easier than ever for people of all ages to benefit from straightening their teeth. It’s important to have a full dental consultation before choosing to have orthodontic work done so that a specialized and customized plan can be created for you or your child. Orthodontic treatment involves the straightening of the teeth and improvement of oral health. 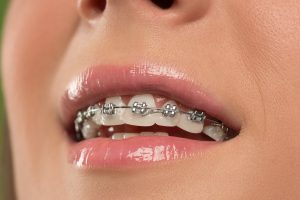 This may involve the use of braces, either traditional or Invisalign, or the use of other appliances like night guards and palate spreaders. Orthodontic treatment is specific to the individual and no two patient’s treatment will look alike. Who is a Good Candidate for Orthodontics? Virtually any person who is unhappy with their smile is a viable candidate for orthodontic work. Children who have all of their adult teeth as well as adults who have either always wanted braces or had them when they were younger but never maintained the results can benefit from having orthodontic treatment done. Orthodontic treatment involves taking x-rays and devising a plan specific to that person’s smile and facial structure. You are unhappy with the way your smile looks. Your teeth are crooked or misaligned. You have an over or underbite. You have speech problems because of tooth alignment. You have been told in the past that you should have braces or some other type of orthodontic treatment. If you want to experience the benefits of orthodontic work, contact us today!